Hypericum is a pretty little shrub with cheery yellow flowers that have a burst of long, showy stamen in the center. All members of the genus may be referred to as St. John’s Wort. The blossoms last from midsummer until fall, and they are followed by colorful berries. St. John’s Wort plant care is a snap, so let’s find out how easy it is to grow these delightful shrubs. Common St. John’s Wort (Hypericum perforatum) has been used as an herbal remedy for its anti-inflammatory and healing properties since the Middle Ages. 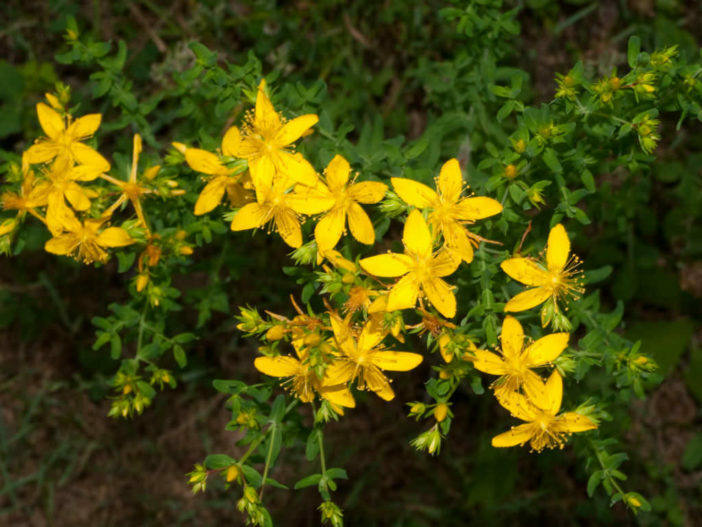 Many ancient herbalists, including Hippocrates and Pliny, recorded the medicinal properties of St. John’s wort. If you live in USDA plant hardiness zones 5 or 6 to 10 and have a partially shaded site, you can probably grow St. John’s Wort. The plant isn’t particular about the soil type. It grows well in sand, clay, rocky soil or loam, and tolerates acidic to slightly alkaline pH. St. John’s Wort adapts to both moist and dry soil, and even tolerates occasional flooding. It also withstands drought but grows best with irrigation during prolonged dry spells. You won’t find a plant that will thrive in more situations. Growing St. John’s Wort herb in a location with too much sun can lead to leaf scorch, while too much shade reduces the number of flowers. The best location is one with bright morning sunlight and a little shade in the hottest part of the afternoon. If your soil isn’t particularly fertile, prepare the bed before transplanting. Spread about 2 inches (5 cm) of compost or rotted manure over the area and dig it in to a depth of at least 8 inches (20 cm). Transplant the shrubs into the garden, setting them at the height at which they grew in their containers. They grow only 1 to 3 feet (30 to 90 cm) tall with a spread of 1.5 to 2 feet (45 to 60 cm), so space them 2 to 3 feet (60 to 90 cm) apart. Water slowly and deeply after planting and keep the soil moist until the transplants are well-established. St. John’s Wort makes an attractive ground cover and soil stabilizer. Once established, the plants need no care, and this makes them ideal for out-of-the-way locations. You can also use it as an edging or to mark boundaries and pathways where you don’t want to obstruct the view. Other uses include containers, rock gardens and foundation plantings. The species plants self-seed and can become weedy, particularly common St. John’s Wort. Ornamental cultivars are well-behaved plants that aren’t likely to grow out of control.